This geographic paper edition of the Underground map shows the Railway lines belonging to the Underground Group as well as the Central London Railway, the Waterloo & City Railway and Metropolitan Railway lines. Each line is represented by a different colour, other railways are marked with lighter black lines, London United tramways are shown by brown broken lines and other tramways routes are marked with a green broken line. General geographic features such as roads and parks are also included. Lines which are served by two railways use the colours of both lines. On this map Euston Road is still shown, Tottenham Court Road is shown twice, at the original station and also for the renamed Oxford Street Station, although the name Oxford Street still appears. Earl's Court Exhibition Ground is marked on this map as well as the Franco-British Exhibition at Shepherd's Bush. The Central London Railway extension to Wood Lane is represented as a broken blue line. 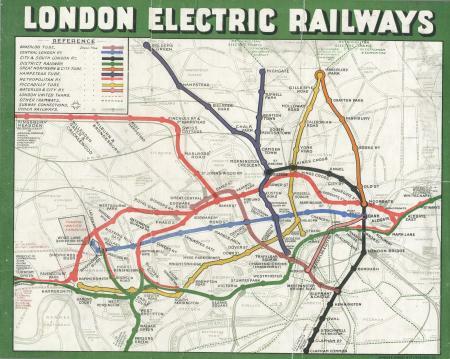 This map has a green border with the title 'London Electric Railways'. 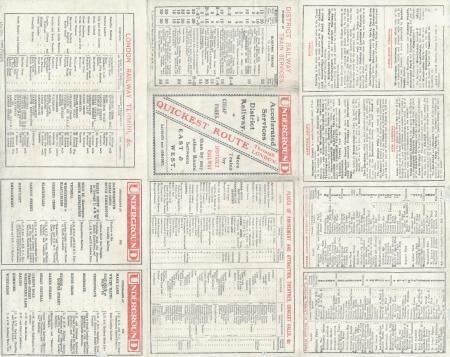 The reverse is printed in black and red and information given includes a list of London Railway Terminals and Underground interchanges, District Railway train services and places of interest. Content text : UndergrounD / Accelerated Services on District Railway. / CHEAP FARES QUICKEST ROUTE Through LONDON. / More Trains by DISTRICT RAILWAY than by any other Route between EAST & WEST / RAPIDITY and COMFORT.